Back in the 1950s when the legendary actor Raj Kapoor rose to fame with “Awaara” and enjoyed wild adulation to the 1970s when the then Soviet president Leonid Brezhnev met Indian Prime Minister Indira Gandhi and bhai-bhai politics between India and the USSR was blossoming, Madan Lal Madhu, a journalist, writer and translator, acted as a bridge-builder in fostering closer cultural ties between the two friendly countries. 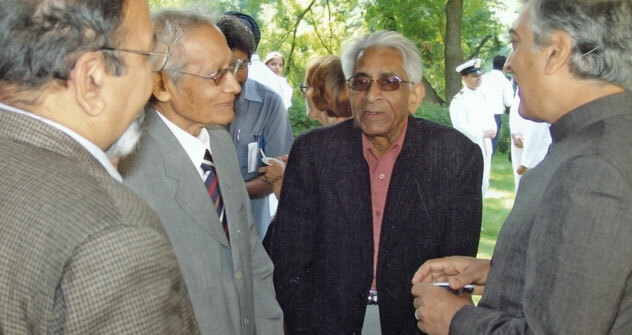 A well-known poet and playwright, a founder of the Indian community association, Shamat, in Moscow and an eminent journalist writing analytical articles on the life in the USSR for Indian dailies, the English-language Tribune and the Hindi edition of the Times of India – Madhu was engaged in so many activities that it’s hard to believe that all of them were performed by one individual. After India’s first prime minister Jawaharlal Nehru’s historical visit to the Soviet Union in 1955, then president Nikita Khrushchev visited India in 1957. Cultural cooperation was one of the key questions on the agenda. Translators and editors were in high demand for working in Moscow. Madhu was among those invited by the Ministry for Foreign Affairs for working in Moscow. By 1957 he got his Master’s degree and had already been teaching for 10 years. He had also published two volumes of poems, plays and literary articles. One of his less-commented tasks was translating Communist literature of the time that included works on Marxism and Leninism. But for Madhu, literature always remained his true calling. Looking back, it’s astonishing that Madhu and his colleagues, who came to work in Moscow for the first time, didn’t speak a word of Russian. So they had to work with the existing English versions of Russian works, translating them from English into Hindi. As he says, they had a controlling editor, a Russian native-speaker who was fluent in Hindi, who checked if there were mistakes and how accurate the translations were. And this was the time, Madhu recalls, when he realised that it was impossible to convey all the nuances and subtleties of novels, stories and poems he translated unless he read all the works in the language of the original. So he started to learn Russian on his own. And it proved to be a lifetime journey of mutual self-discovery. It was a tremendous joy for him to have a more profound understanding of the literature he translated and to hone his skills as a translator to perfection. It’s hard to name all the literary works he translated, but the ones that immediately spring to memory are ‘Medny Vsadnik’, Little tragedies, Fairy Tales, Belkin’s stories, ‘Kapitanskaya dochka’, ‘Pikovaya Dama’ by Pushkin, ‘Voyna I Mir’ and ‘Anna Karenina’ by Tolstoy, ‘Bednye lyudi’ by Dostoyevski, Chekhov’s and Ostrovski’s works. Lermontov, Mayakovski, Chukovski, Barto, Marshak were among the poets he translated into Hindi. But possibly the biggest challenge throughout his career, Madhu admits, was ‘Voyna I Mir’ (‘War and Peace’) by Leo Tolstoy. When asked about the reasons, he seems lost in thought for a while and then says: ‘There was so much going on in the plot and every character was a unique personality. Also there were so many battles described in the book. And being a person of non-military background, I had to work hard to depict them with the utmost accuracy. I even had to consult the embassy to get the necessary knowledge’. Madhu finds that there are a lot of cross-cultural connections in the literatures of the two countries, and there are many subjects that stirred the hearts of both Indian and Russian writers. As an example, Dr. Madhu tells about his PhD dissertation and a book called ‘Gorki aur Premchand: Do Amar Pratibhayen’ on comparing the two famous writers, Maxim Gorki and Munshi Premchand. Both of them were concerned with social issues such as poverty and injustice and devoted their works to illuminating the lives of ordinary people. Madhu says that finer sensitivity to the trials and tribulations of the ordinary man is a common theme that cuts across Russian and Indian literature. According to Madhu, Leo Tolstoy is among the strongest influences of the Russian literature on the Indian people and writers. “His ideas were and still remain very popular in India,” says he. “Leo Tolstoy and Mahatma Gandhi were in correspondence, and Tolstoy had a great influence on the Indian independence movement’. Also, Gorky’s ‘Mat’ (‘Mother’) is among the favourites in India, he adds, because of the depiction of a ‘small man’s’ life, the struggles and tribulations of a poor person. Indian literature also had a great impact on Russian readers. In the author’s opinion, Rabindranath Tagore was “a separate story” for people in the Soviet Union, his poems were read avidly and his name was familiar to every schoolboy or girl. Among other Indian writers whose works were highly appreciated in Russia were Premchand and Surdas. Madhu also authored two books of memoirs. The first one is dedicated to his life in India, his MA studies and work as a teacher. And the second book tells about his life in the Soviet Union, meeting an host of Soviet and Indian state leaders – Leonid Brezhnev, Alexei Kosygin, Rajeev Gandhi and Indira Gandhi. Madhu’s multi-faceted work came in for high recognition when the Indian government bestowed on him Padma Shri, one of the highest Indian civilian honours, in 1991. In Russia, then President Vladimir Putin honoured him with the Friendship Order in 2001. “I was really happy when I received the Friendship Order. There were so many high-profile personalities from different ministries there,” recalls a proud Madhu. And then were a string of special events organised to celebrate of 50 years of his work in Moscow at the Jawaharlal Nehru Cultural Centre, and his 85th birth anniversary. When asked if he had ever considered coming back home to India, Madhu’s voice brims with emotion and conviction. ‘I love my profession – literature. And an opportunity to work in literature, to translate Russian literary works means a lot to me. And I had this opportunity in the Soviet Union. And besides I was already used to living in this country’. Madhu was given a two-room apartment at the centre of Moscow. The publishing house they worked for gave apartments at once to all the interpreters. He had an opportunity to get a free ticket to India every three years, and later every two years. He candidly says that as an Indian citizen he enjoyed a much greater freedom in travelling abroad than his Soviet friends. During his life in the USSR, he visited London, Paris, Rome, Stockholm, Harvard University and Boston. There were many reasons for his decision to stay on in the Soviet Union. But probably the most important one was Tatyana – his Russian wife. He met Tatyana after three or four years of working at the publishing house in Moscow. She was the controlling editor back then. They had worked together for a long time. And soon they discovered they had feelings for each other. Now they have been married for more than 40 years. ‘A person is rooted in the country, this relationship attached me to the life in Moscow even more,’ says Madhu. Nowadays Madhu and Tatyana spend most of their time in Russia, but he stays for one or two months a year in India. He has a lot of friends back home and appreciates an opportunity to spend time with them. Tatyana, he says proudly, enjoys those visits as well, she speaks perfect Hindi and feels very comfortable in India. “There have been many colours and shades of my life in Russia and together they create a separate picture,” he says.